Outdoor movie screens for rent. Atlanta Georgia area. We also rent out party rental equipment. One stop shop for your party rental needs. Movie Screen rentals include HI-DEF DLP projector, AWESOME sound system, DVD and Blu-Ray player. You supply the movies. We have a great Fender sound system, one of the best. Delivery charge is based on your location. Setup is included with the delivery charge. Great for movies, video games, music videos, wedding picture slide shows, football games and more. 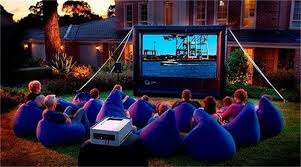 Remember, you can use the movie screen indoors if space allows. We do movies in school gyms, warehouses and large buildings. Weather is no problem! IT MUST BE TOTALLY DARK TO VIEW THE SCREEN!! It will not show in the daylight or even dusk. Movie screen rentals are extremely popular from April until October. Do not wait too late to reserve a movie screen rental. You should try to reserve at least a month away from your event during these months. **Showing movies for public event usually requires a license fee. Go to the following links to obtain a license.